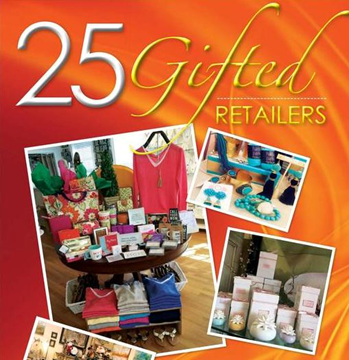 Each year, Gifts & Decorative Accessories honors gift retailers around the country in its 25 Gifted Retailers Report. This year, we feel it is more important than ever to honor gift retailers around the country who are finding ways to overcome challenges and be successful. In this report, rather than focusing on sales volume, we focus on the specific ways gift retailers are uniquely serving their customers. Each Gifted Retailer selected will have a listing written for their store, listing key information and what makes their store different than the rest. Additionally, each Gifted Retailer will have the opportunity to submit photos of their store to accompany their listing. This is a great (and free!) opportunity for gift retailers to receive the recognition they deserve. A copy of the November issue featuring the report will also be sent to each Gifted Retailer. For a chance to be featured as a Gifted Retailer in this year’s report, please go to www.giftsanddec.com/25GiftedRetailers2017 and fill out the form.